I’m kicking off 2018 with a blog post about my One Word for 2018. I’m inspired by the book by John Gordon, Dan Britton, and Jimmy Page. They discovered a better way to become their best and live a life of impact. Instead of creating goals and resolutions, they found one word that would be their driving force for the year. I’ve identified a One Word for three years. In 2017 it was Purposeful. In 2016 it was Gratitude. And, the first word I chose in 2015 was Believe. For 2018 I’ve selected Reflective as my One Word. I hope to be Reflective in 2018 to improve my personal and professional practices. In early December, I had a heart scare which resulted in a wake up call. The short story is I was having chest pains, went to urgent care, was put into the hospital overnight for tests, and discovered I have a healthy heart. The chest pains were caused by complications from my diabetes and Rheumatoid Arthritis, not my heart. I’ve been Reflective the past four weeks thinking how that wake up call caused me to take better care of my health. My blood sugar levels are back on track, I’m eating healthy, and I’ve started exercising again. I’ll be Reflective all year working to take care of myself. I also need to continue to be Reflective at work and pay attention to the feedback I receive and things I observe and learn. The members of my PLN are a great source of inspiration and reflection for me because they share their stories, struggles, challenges, ideas, successes, rewards, and passions. Learning from others helps me be Reflective so I can continue to grow and become a better principal. Have a successful and productive 2018 and I encourage you to find your One Word. ← How Are You Growing and Developing? Nicely done, Mark. We often take things for granted but in reflecting we can better be able to make changes to our lives both in and out of school. Here’s to a happy and healthy 2018. 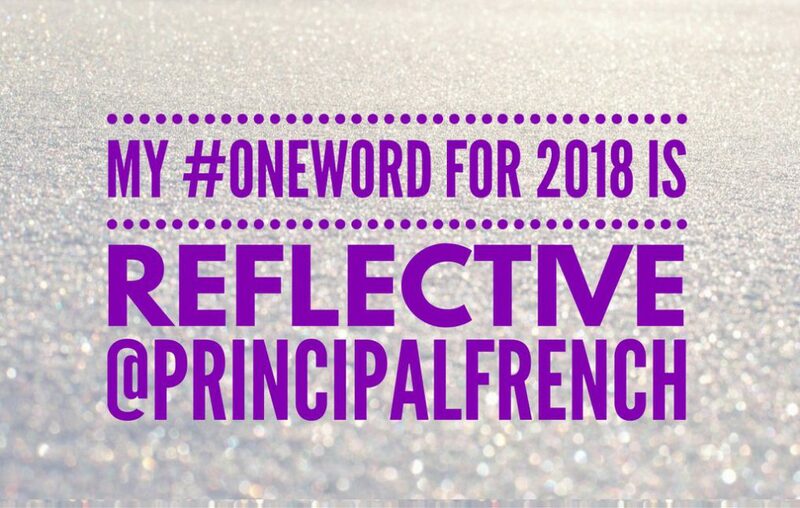 Mark, please add your voice to #NYEDChat on January 8, 2018 when we will discuss EduBlogging: Power of #oneword to Guide Our 2018 Journeys. Reflective is a thoughtful word and I hope that it will continue to guide your way as a professional and in your personal life.